Southeast Asia at that time … was a troubled and unstable region, rife with hostilities and confrontation. The five [founding] nations wanted to build a regional platform that could build trust and cooperation, and put away old suspicion and rivalries. In order to create a stable external environment, and to allow each country to focus on its own nation-building. We can all see the growing geopolitical uncertainties. At the same time, each ASEAN Member State is subject to different pulls and pressures from different powers. In these circumstances, all the more we must stay united and strive to maintain our cohesion and effectiveness. That is the only way for ASEAN to remain relevant and to be of value to our members as well as to our external partners. Singapore’s aim was to strengthen ASEAN’s unity, centrality and diplomatic relevance by investing in integration through trade and technology. Resilience and innovation —the two main themes of its chairmanship—were also a bid to enhance its member economies. 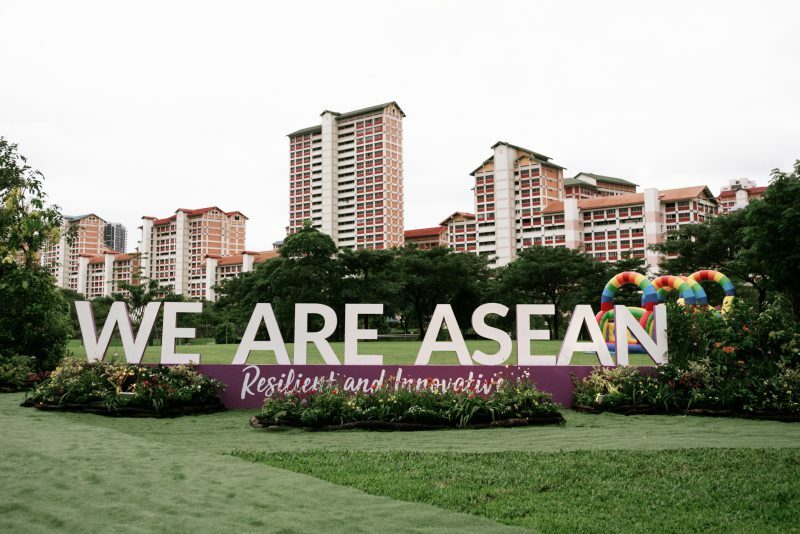 Singapore was keen on preparing the region for the ‘fourth industrial revolution’, improving digital connectivity and cyber literacy and forming the flagship ASEAN Smart Cities Network program. But 2018 hasn’t provided conditions in which ASEAN states could focus solely on growth. China began using its militarised features in the South China Sea, including landing nuclear-strike-capable bombers  and deploying anti-ship cruise-missile-carrying bombers,  and was disinvited from RIMPAC  by the Americans as a result. More recently, one of its Luyang-class destroyers nearly collided  with USS Decatur. In the ASEAN summit statement , the emphasis was on progress towards a code of conduct  for the South China Sea and the need to ensure a conducive environment to finalise it. We … took note of the concerns expressed by some leaders on the land reclamations and activities in the area, which have eroded trust and confidence, increased tensions and may undermine peace, security and stability in the region. The statements from the ASEAN–Australia , ASEAN–India , ASEAN–Japan  and ASEAN–US  meetings at the summit made much of ‘non-militarisation and self-restraint in the conduct of all activities by claimants and all other states’, ‘the importance of maintaining and promoting peace, security, stability, safety and freedom of navigation in and overflight above the South China Sea’, and ‘the importance of … refraining from … activities that could further complicate the situation’. Yet the statement from the ASEAN–China meeting  made no direct reference to militarisation. It included the usual phrases about adherence to the UN Convention on the Law of the Sea and the need to strengthen ‘mutual trust and confidence’. The statement noted with satisfaction that China remained ASEAN’s largest trading partner in 2017 (total merchandise trade was US$441.6 billion). China also rose from being ASEAN’s fourth largest source of foreign direct investment to third largest (investment flows totalled US$11.3 billion in 2017). Given the seriousness of developments in the region, such language seems muted. But the disparities between these statements showcase ASEAN’s drive to manage its relationships with all major powers. There’s an unspoken assumption that the region’s wellbeing goes beyond just the South China Sea crisis. The importance of 2018 lies in the shift in US–China relations. Towards the end of the year, America’s adversarial posture towards China became even clearer, starting from US vice president Mike Pence’s speech  to a domestic audience at the Hudson Institute and continuing at the ASEAN-led summits in Singapore and later at the APEC  meeting in Port Moresby. To the ASEAN member states, the message sounded like pressure to choose  between the increasingly distant and competitive great powers, which isn’t a comfortable prospect for the neutrality-loving Southeast Asians. Trump’s tariff war  with China, and with a number of allies across North America and Europe, put Singapore’s second goal—economic integration—into a much more complicated context. While ASEAN members certainly understand that the tariffs on China are more about US–China competition than broader global trade mechanisms, the US president’s disdain for the multilateral trading system, which has benefited ASEAN’s growth, hasn’t been well received. Given the other significant distractions, Singapore’s chairmanship can be considered fairly productive. It was busy demonstrating the value of its neutrality and centrality by hosting the first-of-its-kind meeting  between Donald Trump and Kim Jong-un soon after the largest defence ministers’ meeting at the Shangri-La Dialogue in June. During the year, Malaysia experienced a political tsunami  in which the UMNO (the United Malays National Organisation, which had ruled since independence) lost power and Mahathir bin Mohamad was re-elected. But his return to power means that some old animosities are back and existing agreements face scrutiny. Since May, Malaysia has tried to scrap the Kuala Lumpur – Singapore high-speed railway , revisit its water supply deal  with Singapore, and fire up the maritime dispute  over access to the port at Johor Bahru. Mahathir’s assertion that Malaysia is Singapore’s older and bigger ‘twin ’ coincided with what will be one of most important political transitions in next-generation Singapore: the announcement of the future successor to Lee Hsien Loong—Heng Swee Keat . Thailand, the ASEAN chair for 2019, is gearing up for elections . Member states will hope that it continues to emphasise intra-ASEAN unity. Huong Le Thu is a senior analyst at ASPI. Image courtesy of the Singapore Ministry of Foreign Affairs on Facebook.